“Koguma no Cake-ya San” has become one of the most celebrated Twitter comics to crossover into the mainstream over the past year. 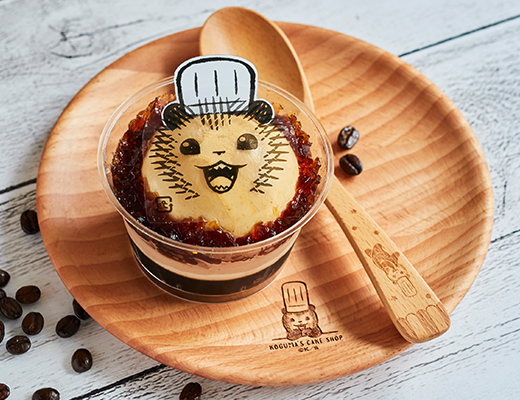 The story of a young bear operating a sweets store has earned its own real-world merchandise and pop-up cafe and now it has reached the peak of the commercial mountain: its own limited-edition offerings at Lawson. The convenience store chain is offering two sweets based on the popular online comic, available as of last week. The first is a pair of miniature cookie pie eclairs meant to resemble the titular bear’s paws (¥260, tax included). The second, more visually striking treat, is a caramel mousse coffee jelly. 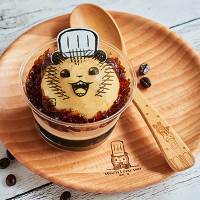 This item (¥320 with tax included) features a more prominent image of the cub on the mousse. Subtlety isn’t a strong point in this line of sweets. The shape is pure cosmetics, but how does the sweet perform in terms of taste? The highlight is the caramel mousse, which offers just enough sweetness without being excessively sugary. The coffee jelly is far less memorable, though it is at least enjoyable on a sweltering day. This treat is probably a pass for anyone who isn’t a fan of the comic, but anyone charmed by this bear’s existence should give it a try.